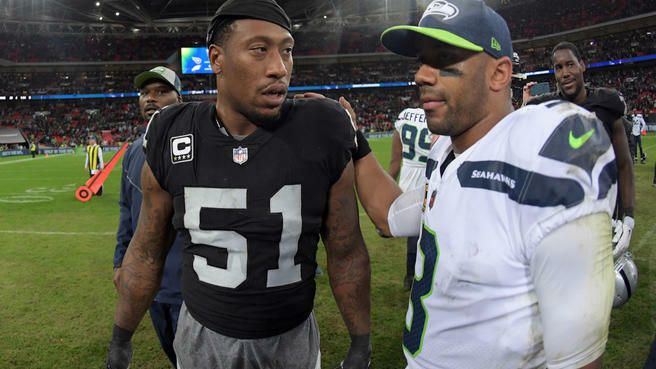 According to a report by Adam Schefter at ESPN, the Panthers are signing former Falcons defensive end Bruce Irvin to a one-year deal. Irvin was part of a very strong 2012 draft class for the Seahawks as their first-round pick. He spent four years there and won a ring before moving on to the Raiders. He played the second half of 2018 in Atlanta (his hometown) and recorded 3.5 sacks in the last four games. After Irvin piled up 22.5 sacks in two seasons at West Virginia, he quickly developed into a key cog on one of the league’s top defenses. Over his time in Seattle (2012-15), the Seahawks defense ranked first in points allowed (15.7 per game) and yards allowed (284.7 per game), third in interceptions (73) and fourth in forced fumbles (71). After leading NFL rookies with eight sacks in 2012, Irvin helped the Seahawks reach the Super Bowl each of the next two seasons. Irvin’s last game with Seattle was a playoff loss to the Panthers at the end of the 2015 season. He then signed as an unrestricted free agent with the Raiders and played there two-and-a-half seasons before being released, recording 18 sacks, 121 tackles and 11 forced fumbles in Oakland. He tied a career high in sacks with eight in 2017.